Welcome to Carlow where the layers of Ireland's ancient history live today. The South East of Ireland is fittingly described as 'River Valleys in an Ancient Land', in acknowledgement of the fact that this most ancient corner of Ireland has a pleasing concentration of historical attractions which are very often set deep in tranquil, scenic river valleys. This is especially true of County Carlow. No other county can boast the same density of early field monuments, Celtic settlements, druidic places of interest and locations of renown. 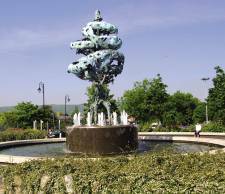 Carlow town lies in the heartland of this rich, vibrant, farming county. It is a modern town, its progressive community rightly pride themselves on the range of facilities and attractions they now offer to their growing numbers of visitors. Bright, well stocked stores vie with small, specialised shops and studios for your attention. All collectively convey a busy buzz of activity while extending a welcoming message to both the visitor and native Carlovian alike. Wherever you roam in Carlow - and the county lends itself to unhurried exploration by motor car, bicycle or on foot ­ you will discover a fascinating history, set in an untouched landscape of culture and heritage. A popular destination for the touring motorist is Altamount House & Gardens which date from the 17th Century. The gardens, which are open to the public on Sunday afternoons and bank holidays from April to October, are a delightful blend of formal and informal vistas. A large, man-made lake provides a perimeter walk with ever-changing views and perspectives, rare trees, shrubs and bountiful wildlife. The Ridge Drive brings contact with Killeshin Church's Romanesque doorway, one of the delights of this area, and provides spectacular elevated views. 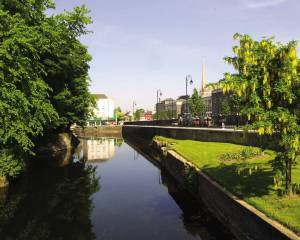 Visit Milford ­ surely Ireland's most picturesque "aquatic junction complex" - and on to Leighlinbridge, a classic example of canal era settlement. Nearby Old Leighlin Village boasts the oldest pub in Ireland - the Cleary family have run it since 1543! Bagenalstown, Borris, Graignamanagh and the Barrow River Valley are also popular touring routes - and a walking route second to none, sure to appeal to the Carlow town based visitor. In the east of the county, Tullow and Hacketstown were important centres of the 1798 rebellion, as was Rathvilly - today more famous for its great record in the National Tidy Towns Competition. it has been National Champion on no less than three occasions. Clonmore is an ancient site with castle and church and an unrivalled collection of early Christian crosses. and other good 18 hole local clubs who welcome Green Fees. A living Celtic tradition where the presence of Celts, Druids and Early Christians is tangible. The Browns Hill Dolmen is a sombre, silent yet eloquent testament to our remote ancestors. Carlow Castle dates to the 13th centuiry. Oak Park Estate and House is now a major research centre. The extensive grounds include a wild life sanctuary and a large artificial lake with eight small and wooded islands. The Town Hall building is the location for a well presented museum. The fine Court House, designed by Morrison, is based on the classic Ilissus in Athens. Much admired is the tall and splendid Cathedral of the Assumption completed in 1833 (floodlit). George Bernard Shaw has many associations with the town, for example the old County Library is part of the Shaw bequest to Carlow. In Leighlinbridge, standing sentinel over perhaps the oldest bridge on the Barrow navigation, on the site of the 12th century Black Castle is Bellingham Castle. Today's sportsman is very well catered for in Carlow. The town's golf course offers a championship standard challenge to visitors, while located near Tullow is the fine new Mount Wolseley Golf Course. Attractive Borris offers a scenic setting for its delightful nine hole course. The River Barrow is itself a centre of sporting activities. It offers superb game angling, while coarse angling is well catered for in both Carlow town and near Graignamanagh and Saint Mullins. The Slaney River near Tullow is a famous salmon river. 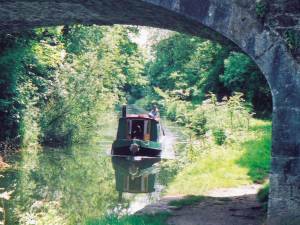 The waterway is much beloved of boating enthusiasts, while for the walker, nature-lover and those with an interest in industrial archaeology, the towns and surrounding countryside provide much to see and do and are themselves a living repository of history. Equestrian activities are also easy to come by in Carlow with AIRA centres to be enjoyed in both Carlow town and Bagenalstown. There are many other smaller gardens in the surrounding area. The following areas are more than suitable for touring from Carlow: Dublin, Powerscourt, Glendalough, Avoca, Wexford, Waterford, Kilkenny, Dunmore Caves, Cashel, Birr Castle. Touring assistance and directions are always available. Miles of towpaths along the river Barrow for those that like serious walking. Higher up, the lovely Mount Leinster Way offers a challenging adventure, while not so challenging are the rural Kilkenny hills overlooking Carlow and its surrounds.